Some fans have suggested that a possible romance between Resistance pilot Poe Dameron and former First Order stormtrooper Finn is hinted at in The Force Awakens. While there is a lesbian character in one of the Star Wars games, an LGBT (not to mention interracial) couple shown on screen in one of the films would be a first. What do you think, is it just the stuff of fanfiction, or could it really be part of the next movie? 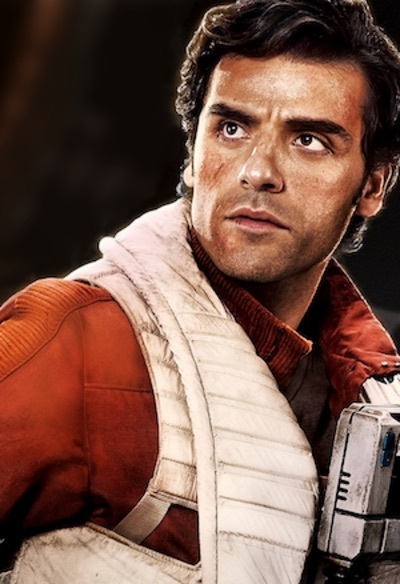 Promotional photo of Oscar Isaac as Poe Dameron, via Wikipedia. Fair use. I could totally see Finn and Poe as a couple. The new trilogy is supposed to loosely mimic the original trilogy, so if Poe is supposed to be this series' Han (the hot shot pilot), and Finn is supposed to be Leia (the hero who escapes the clutches of the empire), then they might just end up being a couple. Time will tell. I might be reading into it something that isn't there, but it did kind of seem that like there were sparks between them, which there weren't between Finn and Rey. It will be interesting to see what happens.